I was born in Sussex in the UK, in a small village called Framfield and never left that area, apart from occasional trips for work. But I have always had a very keen interest in photography, with a particular leaning towards blank-and-white images, and spent much of my early life in a darkroom. This fascination has remained with me to this day, along with the transition into digital photography and all that it entails. My other great interest has been computing, and I have been building my own systems for the last two decades. Both passions would prove very useful when it came to what my wife and I would unearth years later in a small town in the heart of one of Slovakia’s most beautiful national parks. My wife Maria is Slovak, born in the mountain-rimmed Vrátna valley in Malá Fatra national park. Her childhood, as one might expect in such a stunning part of the world, was, she assures me, idyllic. She lived in a chalet next to the Chleb chairlift, learning to ski from a very early age and passing a great deal of time in the surrounding mountains cultivating a knowledge of the area that would likewise prove to huge value to the discovery. In 1998 she left Slovakia for England to work, and this was how we met. Whilst we remained living in the UK, we regularly returned to Slovakia to see her family and it was during one of these visits that I began to learn about her family and in particular her grandfather Milan Šaradin (See Milan Šaradin: Life at a Glance, below). Everything about the man was interesting but the thing that caught my imagination most of all was that he had been a famous and prolific photographer in Slovakia, with an emphasis on this area from the mid 1930s till he died in 1984. The discovery that I made was that literally hundreds of his photographs were still around with, most importantly of all, boxes of negatives which had never been seen by anyone – not even by Šaradin himself – because they were still in rolls in the cans, developed but not printed. For a lot of people, this would have been an astounding find, but for a photographer like myself, nothing short of amazing. Now we fast-forward to 2007, when Maria and I began to build a chalet to live here in Terchová (see Modern-Day Malá Fatra Snaps, below) and a couple of years later we left England and moved here permanently to discover all about this incredible country and its people. By 2012, we had our life over here sorted out. And then came a different sort of sort-out: we approached Maria’s grandmother to ask if we could take all the negatives and photos that belonged to her husband so that I could scan them in to my computer with a view to making a website, putting them there for everyone to see. This she was happy for us to do, so we gathered up all the boxes and took them to our chalet to begin the work…… oh, if only we had known what we were taking on! Just imagine how it was for me to open the boxes and find inside hundreds of envelopes and reels of film. This amounted to thousand upon thousand of negatives, in singles and strips, with barely any explanatory information. You have to realise that these negatives had been sitting in a cellar since 1984: people had been allowed to come and look for the odd picture once in a while, so they had basically been disrupted from any order that might have existed. Because of their many years in the cellar many were damaged by damp, which rendered them unusable. So I decided to just start salvaging what I could, first scanning them and opting to sort them out by adding information as to the locations and people in the pictures afterwards. It soon became apparent that there were many more than I first thought. We have never counted them but by a rough estimate we think there are approximately 8000. For those who are interested in the technical side of the scanning I will list the equipment and software used at the end of the article. (see Tech Spec: How Šaradin’s Images Were Preserved, below). So I embarked on what turned out to be a long, long job: nearly four years to be exact! Nevertheless it was a magical time. Every time I put new negatives in the scanner I would find something that was too good to keep to myself and would call Maria to have a look. I think when I reached 2000 images I decided to start sorting through them more intensely and publish them on a website – at first it was my own site, and then I purchased the existing site in Milans name. And this, at long last, is the result: www.milansaradin.com. Anyone who has ever done anything like this will know how many tasks are involved. First we had to identify each image, who or what it was and when it was taken. Very few of the images came with any accompanying detail: no locations, no names and worst of all no dates of when they were taken. I believe this part of the process took the longest to do. It was necessary to ask family, friends and indeed anyone who could give us any information. For me this was a great learning curve. I learnt the names of mountains, valleys, villages, towns, people and events that I would never have known had it not been for this discovery. Some people even hinted that I probably knew more about the area than those who lived here. I don’t know about that but I gained a lot of knowledge about this place I live in thanks to Milan. Eventually, anyway, we gained a database of pictures. We put most of them online and continued to scan the rest. To date I have around 4500 black and white plus 500 colour images on my computer and I estimate this to be roughly 60% of the total number of negatives – the best quality ones to be precise. On the website at the moment I have nearly 3500 pictures but I am in the process of redesigning – with the end intention of having 5000 there for all to see. Our thinking has always been that these photographs are of such historical value to the area that they need to be seen by everyone from the people who lived during the period the images cover down to the younger generation who never saw what it was like then. But the body of work as a whole is of immense value to a wider demographic. It spans a huge chunk of Slovakia’s recent past from the 1940s through to the 1980s, and shows unusual glimpses into how people lived, worked and played: an important insight not only into the times but also, in a country as seldom documented or championed as Slovakia is, an insight into the foundations of Slovak culture during almost the entirety of its time under Communism. All this feels, in short, like a glimpse into something which would otherwise forever have remained hidden. During his life Šaradin was a keen photographer, but also a campaigner for the conservation of the environment, civic developer, sports personality and publicist. 1930 – 1937 He worked as a Typographer in Zilina for a print company called Krano. 1939 – 1944 He was manager of a Malá Fatra mountain hotel in Štefanová, during which time the hotel was burned down, amongst many others in the area, by the Germans. 1944-1947 After the war he organised the rebuilding of Malá Fatra’s most popular mountain house, Chata pod Chlebom (Chalet under Chleb). 1947-1962 From 1947 he organised the building of the main chair lift in Vrátna and also played a role in the construction of other lifts in the Vrátna area. Then for a time he was the man in charge of the area’s chairlifts. He co-founded the Mountain Rescue Service in Vrátna, which became the Malá Fatra region’s key Mountain Rescue base. Mainly due to his dedication and love of the local area, he founded the first tourism centre for Terchová and its surroundings. 1962-1967 He was so successful in promoting the area that Vrátna was added, in 1962, to the international category for tourism and five years later (1967) he helped Vrátna to become an Area of Outstanding National Beauty and ultimately the National Park (národný park) of Malá Fatra that exists today. Besides his many publications, in 1996 during Janošíkové dni (an annual festival in honour of the region’s fabled outlaw, Juraj Jánošík), Šaradin’s work was included as part of the Vrátna – Malá Fatra exhibition. A book was also produced, “Veď je tá Terchová” which contains many of Milan’s photographs. He was also an active member of a climbing club, IAMES, and he received many awards for his work with the mountain rescue service, tourism, skiing and climbing. The majority of his work was dedicated to this beautiful area that he loved. If people are interested they can see photos of the construction of our chalet on my website. We also detail a lot of what we do over here in Malá Fatra on our blogs, Mikez Blog covering general information and Marias Blog on which she talks about beekeeping and crocheting in Slovakia. People always seem to ask how things are done so this is the techy side of the discovery. I scanned the negatives using an Epson Perfection V700: this is a flatbed scanner with film holders and produces very good results. The scanning software is Lasersoft Silverfast Studio Ai Version 8.5. The negatives get scanned into my Homebuilt PC. The software I use to process and archive the images was originally Adobe Lightroom but now I use Capture One Pro. I have not retouched the images in any great amount, because they varied in condition and colour. One thing I did to them all was de-saturate the colour: thus leaving them in pure black and white and crop if needed. However I have kept the original scans before any adjustment was made (much like keeping the negatives or RAW images of today). I am in the process of rebuilding the website with the intention of putting all or most of the images online using the Genesis framework which should allow faster access. Taking the cable car up from the head of the picture-postcard valley of Vrátna, to the saddle of Snilovske Sedlo just below the peak of Chleb, in the heart of Malá Fatra National Park, was in danger of being too common an activity for it to feature on this site. We debated for some time whether to include such information until we realised that actually, there was precious little good in-English info on it AND that whilst Slovaks and Czechs do indeed arrive in their droves, to other foreign tourists the delights of the Vrátna-Chleb area are still likely to be utterly unknown. Embarking from Žilina at around 8am in time for when the cable car opens at 9am, you can do EVERYTHING mentioned here from “The Vrátna Cable Car Base & Up” paragraph down in an easy day trip – a half day if you’re quick about it – which makes what follows a superb introduction to Slovakia’s loveliest swathe of mountain scenery for those pressed for time. On the way up to the cable car base, you’ll pass through the main settlement in the area, Terchová, and up the ensuing (and gorgeous) valley – which we’ve included info on here too (and will doubtless feature more posts on at a later date, as there is enough to do in the valley alone for several days’ holiday). The sheer shimmering verdant loveliness of the Vrátna valley begins at Terchová – the resort village that clusters at the valley’s entrance about 25km east of Žilina. Some call Terchová overly touristy and a tad crass – I disagree. Compared to the rampant commercialism that has ruined countless other villages and towns in the world, Terchová’s development has been tasteful. It retains most of its attractive mountain-style houses with steep-pitched roofs, the accommodation and eating options are appealing, and whilst it makes a lot out of being the erstwhile holing-up spot of that prince of Slovak outlaws and folklore, Juraj Jánošík, the fanfare is mainly confined to the outlaw’s far-larger-than-life likeness on the hill outside town and a small, understated and very informative museum by the Terchova Tourist Information Centre. There is also an up-and-coming brewery in town, Vršky, which is part of the homonymous restaurant/penzion, giving you that added incentive to stop by for a beer: especially as it’s Slovakia’s first small-scale mountain brewery (as signs here proudly claim). The 15-odd minute drive up the Vrátna valley from Terchová is sensational today – sheering pea-green slopes, overhanging crags and a road that somehow twists in-between them and ever upward – but it also makes the Jánošík tales assume an added dimension. This would have been perfect ambush terrain, you are soon thinking. About half-way up, as this MAP shows, a separate road branches off left to Hotel Boboty (vast, vaguely monstrous, but quite decent rooms) and the idyllic hamlet of Štefanová, where you can also bed down at a couple of penzions therein. A little further on is a ski area, known as the Vrátna Free Time Zone. You can see this section of the valley on this MAP. Another access road to the top of this ski resort winds up from Štefanová, via the highest mountain cottage hereabouts, remote Chata Na Gruni. At the bottom of the ski area on the Vrátna Valley road you’ll also find a very fetching rugged, traditional koliba, Koliba Stary Dvor – essentially a Slovak mountain-style restaurant. Enjoy – it’s the best place to eat in the lower reaches of the valley! Off to the right of the Koliba, a network of lanes ascends to another accommodation area – including the very good Hotel Rozsutec which has a wellness centre. You’ll wend through all these valley attractions on the bus up to the Vrátna cable car base. Terchová and this valley, followed by the cable car ride up to Snilovske sedlo as the final delight is all a very lovely and gentle initiation into the delights of the Malá Fatra National Park – sedate, let’s say, with easily accessible scenic spots – but up at the top of the cable car terminus the geography gets a lot more intense, wild and thrilling. The bus drops you at the cable car base, aka Vrátna Výťah. A couple of snack stands, souvenir stands and kiosks are scattered around, somewhat hopefully, but armed with the knowledge of what awaits up top, dearest blog follower, there is no need to linger. At the top cable car station there is a restaurant (cracking views, less impressive food, although you may decide risking the latter may be worth it to fully enjoy the former) that is a popular refuge when the bad weather cuts in and the cable car stops running. Actually, for many people, the restaurant represents the turning-back point of their foray into Vrátna – and this is a shame. Snilovske sedlo, a wide broccoli green saddle between two peaks, is a superb starting point for any number of first-class hikes – and particularly as the cable car has spared you the tough legwork by doing the majority of the climbing for you, the area fairly begs you to explore it a little. The two short hikes that follow give you a chance to investigate the very best of what the mountain tops near here offer. Behind the restaurant/viewpoint at Snilovske sedlo and with your back to the cable car, off up left is the nearest of the two peaks, Chleb (not to be confused with the Slovak word chlieb, which means bread), clocking in at a decent 1646m. 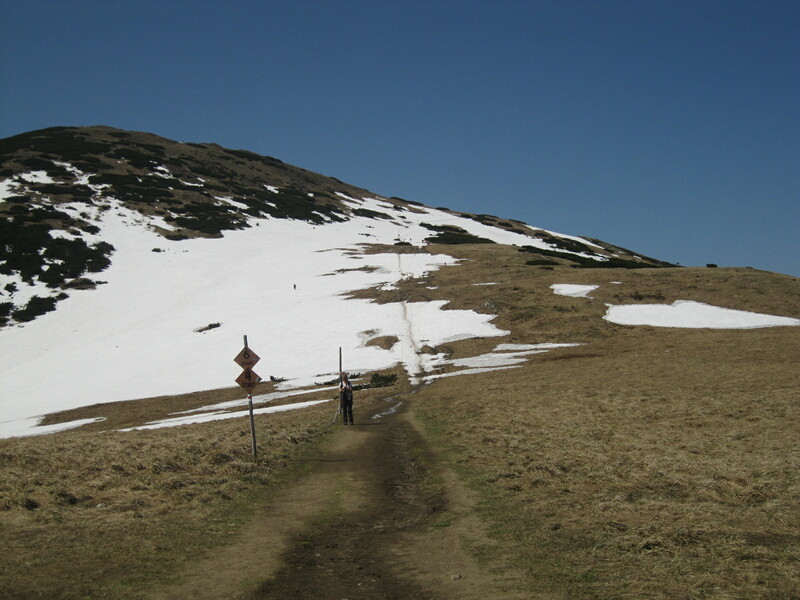 Off right, increasingly visible as you climb the 50-odd metres up to the meeting point of trails hereabouts, is the summit you’re aiming for in this hike, Veľký Kriváň. At 1709m this mountain, approached by a fairly gentle path in a 45-minute hike from the junction of paths, is the highest in the Mala Fatra National Park but gives off a roof-of-the-world feeling with its moody panoramic views, down from the peaks into valleys often bathed a mysterious gold in the sun’s rays and containing two of this region’s most important towns, Žilina to the west and Martin to the south. 45 minutes up, around half an hour drinking in the views at the summit, 45 minutes down. Just over two hours after setting off from the top cable car station and you’re probably feeling peckish. Back at that junction of paths, now follow the route to the right (if you’re descending from Veľký Kriváň) or straight on (coming from the cable car) down between the peaks with Veľký Kriváň away on your right. A straightforward path which leaves the exposed open ground (with stunning moorland views) to dip into woods emerges at the serendipitous chata (i.e. mountain hut doubling as a basic accommodation op and a hearty Slovak-style restaurant) of Chata Pod Chlebom (again about 45 minutes one-way from the path junction). Rustically charming as the hut is, the interior is nothing special so if the weather is half-decent, grab a pew outside in the lovely picnic area and then go to place your order of frothy beer, strudel or giant-sized sausages with bread to eat al-fresco. The food is good and the wild mountain locale is great – with this dark-wood, old-fashioned mountain cottage enhancing it further. Allow 45 minutes to order and eat without rushing, meaning around four to 4.5 hours overall to enjoy both of these out-and-back walks and get back to the topmost cable car station. Still got some energy? Then try hiking back down to the Vrátna cable car base (around one hour more). GETTING THERE: Surprisingly regular (more or less hourly) buses run from the bus station in Žilina through Terchová to the Vrátna cable car base from 6:15am to 6:30pm. The journey takes 55 minutes and costs 2.15 Euros. NEXT ON THE JOURNEY: From Terchová, below Vrátna, it’s 95km south and then east to Podbanské, the end point/ start point of our Tatranská Magistrala trail guide for the most popular path across the High Tatras.